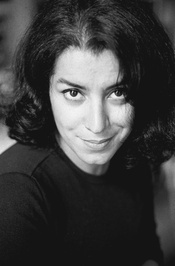 Marjane Satrapi (Persian: مرجان ساتراپی) is an Iranian-born French contemporary graphic novellist, illustrator, animated film director, and children's book author. Apart from her native tongue Persian, she speaks English, Swedish, German, French and Italian. Satrapi grew up in Tehran in a family which was involved with communist and socialist movements in Iran prior to the Iranian Revolution. She attended the Lycée Français there and witnessed, as a child, the growing suppression of civil liberties and the everyday-life consequences of Iranian politics, including the fall of the Shah, the early regime of Ruhollah Khomeini, and the first years of the Iran-Iraq War. She experienced an Iraqi air raid and Scud missile attacks on Tehran. 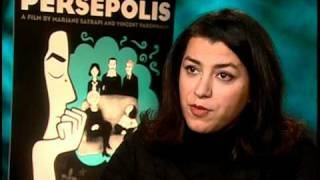 Accordin Marjane Satrapi (Persian: مرجان ساتراپی) is an Iranian-born French contemporary graphic novellist, illustrator, animated film director, and children's book author. Apart from her native tongue Persian, she speaks English, Swedish, German, French and Italian. Satrapi grew up in Tehran in a family which was involved with communist and socialist movements in Iran prior to the Iranian Revolution. She attended the Lycée Français there and witnessed, as a child, the growing suppression of civil liberties and the everyday-life consequences of Iranian politics, including the fall of the Shah, the early regime of Ruhollah Khomeini, and the first years of the Iran-Iraq War. She experienced an Iraqi air raid and Scud missile attacks on Tehran. According to Persepolis, one Scud hit the house next to hers, killing her friend and entire family. Satrapi's family are of distant Iranian Azeri ancestry and are descendants of Nasser al-Din Shah, Shah of Persia from 1848 until 1896. Satrapi said that "But you have to know the kings of the Qajar dynasty, they had hundreds of wives. They made thousands of kids. If you multiply these kids by generation you have, I don't know, 10-15,000 princes [and princesses]. There's nothing extremely special about that." She added that due to this detail, most Iranian families would be, in the words of Simon Hattenstone of The Guardian, "blue blooded." In 1983, at the age of 14 Satrapi was sent to Vienna, Austria by her parents in order to flee the Iranian regime. There she attended the Lycée Français de Vienne. According to her autobiographical graphic novel, Persepolis, she stayed in Vienna through her high school years, staying in friends' homes, but spent three months living on the streets. After an almost deadly bout of pneumonia, she returned to Iran. She studied Visual Communication, eventually obtaining a Master's Degree from Islamic Azad University in Tehran. Which book should be our November (banned books) group read? Is this you? Let us know. If not, help out and invite Marjane to Goodreads.